I promised I wouldn’t hold out too many roguelike games unless they could show off something unusual, either thematic or mechanic. The *angbands from a week ago were all viable games, but either didn’t bring anything new to the table, or just didn’t quite satisfy. Frozen Depths is definitely one to take home to mother though. Since I am the one making a big deal out of themes and mechanics, I’ll introduce it on those grounds. 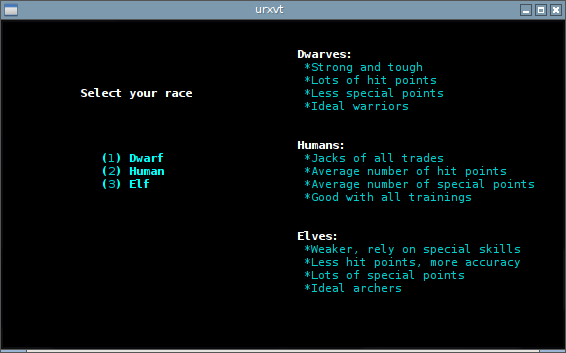 This is a strictly surface-down fantasy game, with a simplified set of races and professions. Everything is cold-themed, which is great because it avoids the vampire-quokka odd couple I talked about the other day. I see no problems with mud monsters and frost crabs wandering into the same room to deal me a tag-team smackdown. There’s no outside world to explore, no external quests to pursue, and the only goal (that I have found) is to explore the depths of the dungeon and find the source of the cold that threatens the surface world. Climb out of the dungeon and your life is forfeit as a coward, which means … a-hunting we will go. Your own body warmth comes into play though too, with a need for warmer clothes as you go deeper and deeper, and warm food as a way of keeping yourself from freezing. 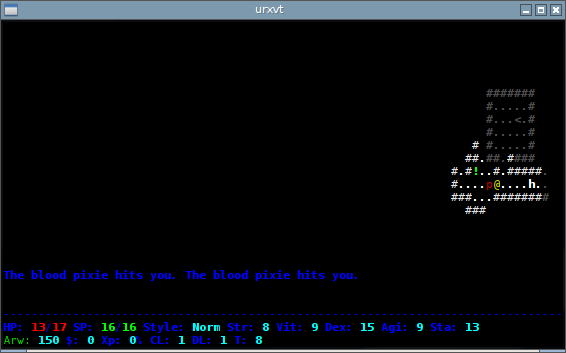 Clothing (not armor) and temperature seem like rare additions in a roguelike game, so this twist piques my interest. Frozen Depths picks up on some newer conventions in other games: There is a religion system which reminds me vaguely of Stone Soup, but seems more basic (which may actually be a blessing). There’s no magic in Frozen Depths, and the home page suggests it may be a deliberate omission for the sake of simplicity. There is also a skill (and/or feat) system, which lets you customize your adventurer as he or she becomes more and more powerful. And the game keeps track of some important features that you’ve met on your downward journey, sort of like a journaling system. 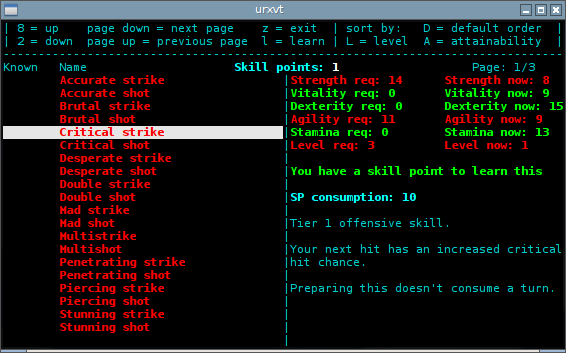 From a mechanical standpoint, controls and keypresses are much like normal roguelikes, with the arrow keys controlling movement and melee, while a targeting system is controlled with the “f,” “t” and “s” keys. The question mark brings up an entire list, and the “u” key is dedicated to activating items in the environment (plundering corpses, for example). Inventory is split from equipment, which means there’s a distinct screen for listing usable items, and a screen dedicated to what you’re wearing and wielding. This is a huge improvement over the traditional rogue-ish keys that dedicate one keypress to armor, another one to weapons, another one to rings, another one to cloaks, etc., etc., ad infinitum, ad naseum. 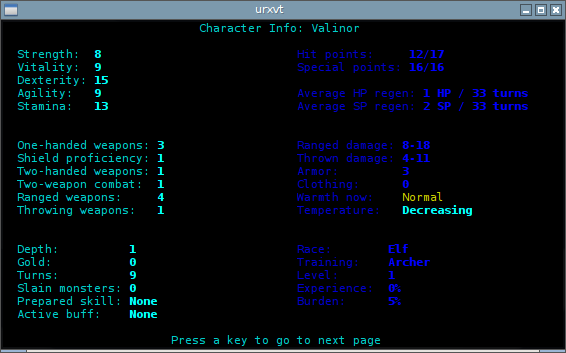 Dungeons seem to be limited to one screen of at least 80×25, with the lowest two lines as a character rundown (a full sheet is available with the “@” key). Two lines above that are status display and combat messages, and the remainder of the screen is your gameplay map. It does sometimes mean you have to page through narratives that are too long for the space they appear in, but in Frozen Depths I never felt like I had lost essential information to the display space. Frozen Depths throws in a few added effects that I really like. There’s a three-page tutorial for newbies. Killing a monster splatters the walls with blood, and they appear red. Some passages are blocked by ice, and you’ll have to bash your way through them, which sometimes leaves little ice shards around. And Frozen Depths makes a distinction between what you can see and what you’ve seen, with bolded colors representing your field of view. The game boasts of 35 levels, although I didn’t have time to see more than the first three or four. What’s at the bottom of the dungeon? I don’t know. You’ll have to explore and find out. Storywise I could ask for a little more from Frozen Depths, but there’s enough here to justify it as a game; it’s at least as structurally sound as angband, even if it doesn’t pull in an entire mythical world, like adom. And considering that triple-A titles like Dragon Age carve away huge chunks of conventional fantasy genres and are still magnificent role playing games, I’m comfortable with the lack of a magic-based profession. I’d like to see it happen, but I’m not complaining either. One last note before I hand out the gold star you know is coming: Frozen Depths is a free game, but it’s not open source. More’s the pity, but if you need to know licensing requirements or the reason for a closed-room approach, you can read the home page or take it up with the author. 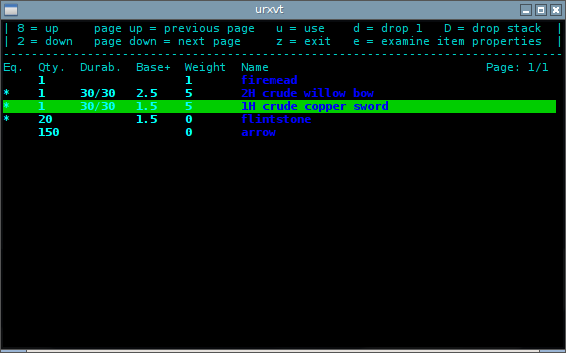 Either way, Frozen Depths is in AUR, but not Debian; the download is a precompiled executable with support files. This entry was posted in Linux and tagged game on 2015/03/24 by K.Mandla.